Dupaco is YOU, optimizing every stage of your financial life. When you’re a Dupaco member-owner, you know this: You are learning. You are earning. You feel—and are—more financially empowered. And you don’t have to bank on a bank anymore. As a financial cooperative, we help members save money—with a savings account, lower loan rates, fewer service fees, low-cost insurance, the list goes on—we help grow the whole credit union. We’re dedicated to putting (and keeping) you on the right financial track, in perfect sync with the life YOU want. Opening your Dupaco "share account" with as little as $25 automatically makes you a member-owner at Dupaco. This gives you access to free programs like Credit History Lessons and Money Makeovers that can sleuth savings opportunities. Plus, you will have easy access to your money through Shine online and Mobile Banking, plus access to our Co-op Shared Branch Network of over 5,000 branches and over 2,000 self-service locations. Our vision is to be our members’ lifetime financial home. Our mission is to improve our members' financial position and build valued relationships by delivering personalized financial advice, products, and service. Dupaco, the Dupaco logo, Thank Use and Your Money For Good are registered trademarks of Dupaco Community Credit Union. All other Dupaco trademarks, service marks, domain names, logos, company names and indicia of origin referred to on the websites are either trademarks, service marks, domain names, logos, company names or indicia of origin or are otherwise the property of Dupaco Community Credit Union or its affiliates or licensors. Other product or company names referred to on the website may be trademarks of their respective owners. You may not use any trademark, service mark, domain name, logo, company name, trade name or indicia of origin of Dupaco or any third party without permission from the owner of the applicable trademark, service mark, domain name, logo, company name, trade name or indicia of origin. All rights not expressly granted are reserved. You are eligible to join Dupaco if you live or work within our charter area, illustrated below, or have an immediate family member who is a Dupaco member. To become a member, simply open a savings account with $25 or more. Even if you move you can still take advantage of all Dupaco's service offerings as long as you keep at least $25 in your savings account. 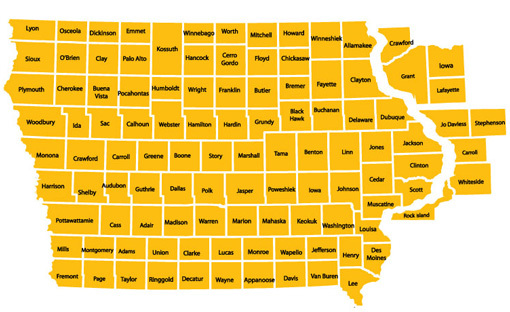 Dupaco is chartered to serve those who live or work in the counties of Adair, Adams, Allamakee, Appanoose, Audubon, Benton, Black Hawk, Boone, Bremer, Buchanan, Buena Vista, Butler, Calhoun, Carroll, Cass, Cedar, Cerro Gordo, Cherokee, Chickasaw, Clarke, Clay, Clayton, Clinton, Crawford, Dallas, Davis, Decatur, Delaware, Des Moines, Dickinson, Dubuque, Emmet, Fayette, Floyd, Franklin, Fremont, Greene, Grundy, Guthrie, Hamilton, Hancock, Hardin, Harrison, Henry, Howard, Humboldt, Ida, Iowa, Jackson, Jasper, Jefferson, Johnson, Jones, Keokuk, Kossuth, Lee, Linn, Louisa, Lucas, Lyon, Madison, Mahaska, Marion, Marshall, Mills, Mitchell, Monona, Monroe, Montgomery, Muscatine, O'Brien, Osceola, Page, Palo Alto, Plymouth, Pocahontas, Polk, Pottawattamie, Poweshiek, Ringgold, Sac, Scott, Shelby, Sioux, Story, Tama, Taylor, Union, Van Buren, Wapello, Warren, Washington, Wayne, Webster, Winnebago, Winneshiek, Woodbury, Worth, and Wright Counties in Iowa; Crawford, Grant, Iowa and Lafayette Counties in Wisconsin; and Carroll, Jo Daviess, Rock Island, Stephenson and Whiteside Counties in Illinois.